Have you ever wondered what the Christians of the first century were like and what the Bible and ancient history can teach us about them? If so then Archaeological Diggings magazine author, Daryn Robert Graham's book The First Christians: Not Just Ancient History is for you. ^From the birth of Jesus, and the lives of his disciples, to the missions of apostles and the experiences of the various churches around the ancient world, Graham presents the earliest and most reliable evidence for the personalities of first century Christianity. In doing so he shows us that many early Christians in no sense had just a 'blind' faith, but rather held solid conviction in God and his divine son Jesus Christ. Written for all history enthusiasts as well as the curious, this is a message that can build up our own faith today. 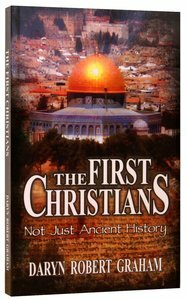 About "The First Christians: Not Just Ancient History"
Customer Reviews For "The First Christians: Not Just Ancient History"
A clear, easy read for the good oil on the First Christians! Who were they? How did they grow so Fast? A classic edition for every families bookshelf. Any person that can read a newspaper, can read and quickly glean what essential first century Christians were about. Well written and a great read for everyone interested in how it all began.